He claimed that the BJP and the Congress were afraid that he would go to Delhi and play a key role in national politics. 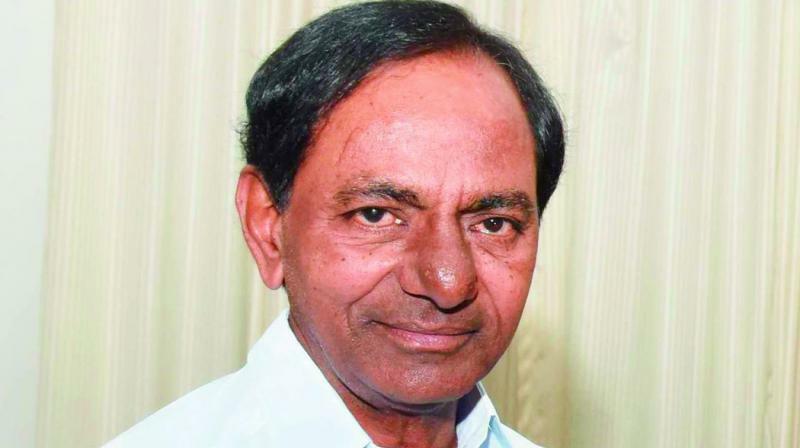 Hyderabad: Attacking the Bharatiya Janata Party and the Congress, Chief Minister K. Chandrasekhar Rao said that the two parties don't have the guts to control Pakistan. Addressing a public meeting at Bhongir on Tuesday, he said that though the two parties have ruled the country for more than 66 years, they have failed miserably to put in place sound polices for agriculture, irrigation and power generation. Reminding the audience of the claims of the two parties — a Congress-less India by the BJP and a BJP-less India by the Congress — he said, "Our slogan is India without Congress and BJP. This country needs relief from these two paupers." Mr Rao asked why many parts of the country were facing drought when India has 70,000 TMCs of water. He asked why half of the country still lives in darkness when we have 3,00,000MW of power. He said it was because of the rule by these two parties that India remained a backward nation though smaller countries like Singapore, Malaysia and Japan entered in the club of the most progressive nations. The Chief Minister said that India has more resources and manpower, but the BJP and the Congress have failed miserably to utilise these resources to propel the nation on the path of progress. Mr Rao claimed that the BJP and the Congress were afraid that he would go to Delhi and play a key role in national politics. They were also afraid that the people of this country would throw them out in the elections, he said. He said the people were tired of Prime Minister Narendra Modi and Congress chief Rahul Gandhi blaming each other. He appealed to the people to cast their votes for the TRS so that it wins 16 parliamentary seats in the state.